Update: This session has now been posted to Channel 9 and you can view the video here. Feel free to post any comments at the bottom of this post. This was a follow up session to the Application Integration Futures – The Road Map and what's next on Windows Azure session that was discussed here. The primary focus of this session was to demonstrate some of the new capabilities of BizTalk On-Premises, BizTalk IaaS and BizTalk PaaS. During the presentation there were many questions as to what the differences between the On-Premises version and the IaaS version would exist. After many questions about a particular feature (BAM, ESB Portal etc) Bala stepped in and declared that all features that exist in the On-Premises version will exist in the IaaS version. After a further discussion after the session, it looks like there is a little more work to do in the area of clustered host instances but otherwise we can expect symmetry between these two versions. Since BizTalk Next (aka “R2”) will be released as part of the latest Microsoft platform offering (Windows Server, SQL Server, Visual Studio), all BizTalk projects will target the .Net 4.5 platform. The primary purpose of this session was to demonstrate some of these new features lets get into some of the scenarios/demos that were discussed. In the first example, the team demonstrated BizTalk consuming a REST feed from the Azure Data Market. Specifically, the feed was related to flight delays. BizTalk connected using the new WCF-WebHttpBinding and performed a GET operation against this particular feed. Since the foundation for authentication when communicating with Azure is the Access Control Service (ACS), Rajesh demonstrated the out of box ACS authentication configuration. 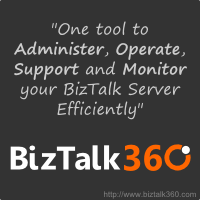 Once again BizTalk was configured to consume a REST service. In this case it was a SalesForce customer feed. Within the Send Port, the “SOAP Action Header” was populated and once again included the GET operation. A custom transport behavior was used to provide the appropriate credentials. When executed, a list of customers was returned from SalesForce. Next, the URI in the SOAP Action header was modified and a hard coded id was provided for a particular customer. In this case only this particular customer was returned. Both myself and Bill Chestnut were thinking “great, but how do we inject a dynamic customer id to this GET request”? Once again the BizTalk team had an answer for this and it came in the form of a new Variable Mapping button. When clicked an interface that will allow us to specify the name of a context/promoted property. Bottom line is that we can drive this dynamic value from message payload or context. Finally, the last SalesForce demo included a POST, where they were able how to demonstrate how to update a customer record in SalesForce.com. 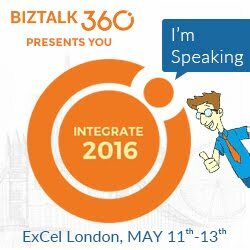 The team then switched gears and started talking about BizTalk PaaS: Azure EAI Services. I have no idea as to whether this will be the official name. This is what the title of their slide included so I am using it here. I do like it. I do like that BizTalk is still associated with this type of functionality. I must caution that the product team did indicate not to look too much into naming/branding at this point. On a lighter side, I did ask if we can expect a Metro version of the BizTalk Admin Console. Don’t expect it any time soon . Basically any new UIs that need to be created will follow the Metro styling but other than that don’t expect many updates to previous tools. This was a great session that included many demos and really proved that what the Product team was speaking to in the previous session wasn’t just lip service. Having been at the MVP Summit, I must say I was pleasantly surprised at the amount of functionality that they have been working on. Once again, I love the direction that they are heading in. It has an updated feature set that should please customers no matter what their ideal deployment model is (On-Premises, IaaS, or PaaS). You can also tell that they are serious about symmetry although it may take a while for PaaS to be closer aligned to On-Premises/IaaS but I think they are headed in the right direction. Thanks for all the updates Kent! It's nice to see there is a solid plan in place to bridge the old with the new.